Treasure Chest Thursday...Rotge or Langford? Sentimental Sunday...A Year In A Truck! 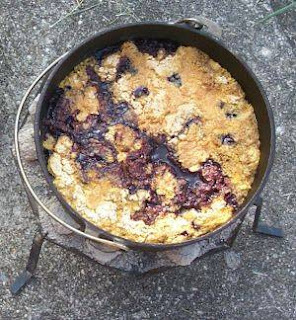 This is a basic simple cobbler recipe, that can be baked over hot coals [which I have done on campouts] or in the oven. It's a fast easy cobbler. And all you do is mix, and dump, the ingredients into the Dutch oven, and bake! Preheat oven to 350°. Melt the butter in Dutch oven. Serve while warm [especially good with a scoop of ice-cream, or as the old folks used to do with heavy cream poured over!]. When you place this in the oven, the fruit is on top... when you take it out... the crust is over the top! The kids love seeing this transformation!